ON WWE RAW LAST NIGHT ON THE HISTORIC DRAFT SPECIAL THERE WAS ONE NAME WHO MADE THE SWITCH FROM RAW TO SMACKDOWN, I THINK YOU ALL MAY HAVE HEARD HIS NAME BEFORE, IT IS RIC FLAIR!! THAT'S RIGHT LADIES AND GENTLEMEN, THE "NATURE BOY" IS HEADED TO FRIDAY NIGHTS. I KNOW ALL OF YOU ARE WANTING TO KNOW THE WEBMASTERS OPINION ON THIS SHOCKING MOVE, WELL I AM GOING TO GIVE YOU MY OPINION, I LIKE IT, DON'T GET ME WRONG, I HAVE BEEN CRITICAL OF SMACKDOWN IN THE PAST BUT THAT WAS THE PAST. 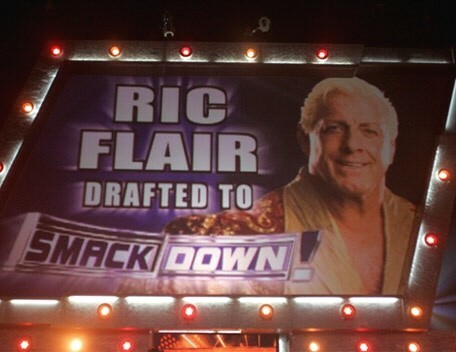 I REALLY THINK THAT IT IS EXACTLY WERE RIC FLAIR NEEDS TO BE RIGHT NOW, FOR STARTERS HE HAS NEVER BEEN A ACTIVE WRESTLER ON SMACKDOWN BEFORE, HE WAS ON SMACKDOWN BEFORE BUT THAT WAS IN EARLY 2002 WHEN HE WAS THE GENERAL MANAGER AND BEFORE THE SPLITTING OF THE BRANDS,AND DO I HAVE TO TELL ALL OF YOU ABOUT THE MATCH UPS HE COULD HAVE THERE. ON THE GUESTBOOK I SEE A LOT OF YOU MENTION THAT YOU WOULD LIKE TO SEE A FEUD BETWEEN FLAIR AND FIT FINLAY, I THINK NOW WE WILL SEE THAT, BUT WHAT I PERSONALLY WOULD LIKE TO SEE IS A MATCH UP BETWEEN FLAIR AND WILLIAM REGAL, NOW I KNOW A LOT OF YOU OUT THERE ARE READING THIS AND YOU ARE SAYING HOW CAN THE WEBMASTER OF A RIC FLAIR WEBSITE LIKE WILLIAM REGAL, BUT JUST KEEP READING AND LEARN SOME THINGS. WILLIAM REGAL (FORMERLY KNOWN AS "LORD STEVEN REGAL") FROM THE OLD WCW DAYS IS A EXCELLENT SCIENTIFIC WRESTLER, HE HAS NEVER GOT THE PUSH THAT HE DESERVES IN MY OPINION, SOME OF THAT IS BECAUSE OF INJURIES BUT REGAL IS NO DOUBT ONE OF THE BEST SCIENTIFIC WRESTLERS OF HIS ERA. WHEN HE WAS IN WCW I LOVED TO WATCH HIM WRESTLE, NIGHT IN AND NIGHT OUT HE WOULD USUALLY BE INVOLVED IN THE TOP TWO OR THREE MATCHES ON THE CARD,WERE HE LACKED IN CHARISMA HE MADE UP FOR IN WRESTLING SKILLS. BACK IN 1994 FLAIR AND REGAL HAD SEVERAL MATCHES AT THE ORLANDO, FLORIDA DISDNEY MGM STUDIOS THAT AIRED ON TV AND ALL OF THEM WERE GREAT MATCHES, I HOPE THAT THEY WRESTLE AGAIN ON SMACKDOWN BUT TO REALLY DO THEM JUSTICE YOU GOT TO GIVE THEM AT LEAST 15 TO 20 MINUTES BUT WITH TODAY'S WRESTLIJNG ENVIRONMENT I AM NOT SO SURE THAT WWE WILL DO THAT. THE ONLY THING THAT REALLY BOTHERS ME IS THAT I AM USED TO WATCHING WRESTLING ON MONDAY NIGHTS INSTEAD OF FRIDAYS BUT THAT WILL HAVE TO CHANGE A LITTLE WITH THESE LATEST DEVELOPMENTS. I READ A ARTICLE ON THE INTERNET OTHER DAY BY A GUY NAMED DOUG AND HE IS TALKING ABOUT HOW IT WOULD BE GOOD FOR RIC FLAIR IF HE WENT TO SMACKDOWN. I SHOULD HAVE PUT THE ARTICLE UP EARLIER BUT I THINK NOW IS ALSO A GOOD TIME TO POST IT EVEN THOUGH THE DRAFT IS OVER BECAUSE IT MAY ASSURE EVERYBODY WHO MAY BE AGAINST FLAIR GOING TO SMACKDOWN THAT IN THE LONG RUN IT WILL BE SEEN AS A GOOD MOVE. SO SCROLL DOWN AND READ THIS GREAT ARTICLE, AND REMEMBER FLAIR FANS, DON'T MISS SMACKDOWN ON FRIDAY NIGHTS BECAUSE FOR THE FIRST TIME EVER SMACKDOWN IS THE BRAND TO WATCH, COURTESY OF THE "NATURE BOY" RIC FLAIR!!! WOOOOOOOOO!!! the opportunity to work with much over the years. to be the best mic worker in the history of wrestling. better, and hes earned better. worth a try. Thinking out of the box. Remember that.